One more thing about birth certificate-gate and that’s it, I promise. The MSNBC-Bill Maher-New York Times-Democratic Party talking points complex will obviously continue to promote the idea that any questions about their guy’s past is racist. Last evening on the PBS News Hour, Mark Shields, a member in good standing of the above-mentioned complex, described it as a campaign to “de-legitimize” Obama and paint him as “The Other,” “an African,” in other words, it’s racist. The complex is basing this campaign on the hope that the public has amnesia. As David Brooks, the PBS-New York Times idea of a responsible conservative, responded to Shields’ lengthy sociological disquisition, both parties always hope for the one “knockout scandal” that will destroy their opponents; in other words, so what else is new? It was not always thus. Neither the press nor the Republicans had much stomach for looking into the lives of either Jack Kennedy or Lyndon Johnson. They weren’t much interested in Kennedy and Johnson’s serial adulterous hook-ups, which could dangerously expose the president to blackmail. Kennedy’s affair with the mistress of mafia boss Sam Giancana was amazingly irresponsible to say the least. In retrospect, the press was stupendously irresponsible to ignore that and the serious illnesses Kennedy suffered from and his habitual use of barbiturates and amphetamines. And no one, to my knowledge seriously investigated how LBJ got to be a multimillionaire while on a government salary for most of his adult life, at least not while he was in office. Ever since then, both parties have reflexively searched for the “smoking gun,” the “cover-up,” the decision to “stonewall,” all gifts Watergate bequeathed to political language. The Republicans suspected Carter crony Bert Lance of illegal chicanery and forced Carter to shove him “under the bus.” The Democrats thought they finally had Reagan, the “teflon” president in Pat Schroeder’s words, with Iran-Contra. Then there was George H.W. Bush’s alleged complicity in allegedly delaying the Iran hostage release until after Reagan’s election. And then, of course , there was Bill Clinton. It never fails to amaze me that you can always find something. But I don’t remember the Democrats complaining about the effort to de-legitimize the Bush presidency because of the wacky 2000 election, or the effort to characterize the mistaken intelligence on WMD in Iraq as deliberate lies. Was that not an effort to de-legitimize, to undermine? I think so. The raking through Obama’s past is nothing new and can be traced back to Watergate, the mother of all knockout scandals. But I will concede that there is a racial, if not racist, element in Obama’s case. And it’s the result of the perfectly predictable legacy of “affirmative action,” otherwise known as racial preference. Critics of racial preference have argued for years that such programs are destructive because they undermine “minority” accomplishments. But what about the “legacies” who get into Harvard or those rich people who putatively bribe their way in? That may happen but they too are viewed with suspicion by those non-legacies, those non-rich, and yes, those non-black or non-Hispanic folks who wonder whether the child of an alumnus, the child of a millionaire, and the minority student were admitted on merit alone. As with the birth certificate, Obama could have stopped the perfectly understandable, if almost never publicly mentioned, suspicion about his admission to elite universities if he had early on released his academic records. Al Gore, John Kerry, George W. Bush all had mediocre academic records (as did Jack Kennedy) and survived. Don’t most suspect that Gore, Kerry, and Bush would have been denied admission to elite universities if not for their family ties and/or money? As I remember, Obama’s wife admitted that she was admitted to Princeton with less-than-Princeton- caliber grades and test scores as did Supreme Court Justice Sonia Sotomayor. Why hasn’t Obama released his records and why hasn’t the media done its job? He’d rather have the race card up his sleeve with the strong confidence that the compliant media will continue to enable him. …[As] much as everyone would like to thwack Trump, he’s a victim of his own monstrous ignorance. He’s a New Yorker, not a Chicagoan. 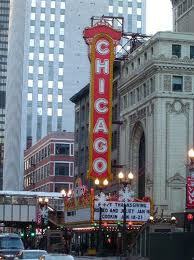 And everybody in Chicago already knew how Obama came to be. 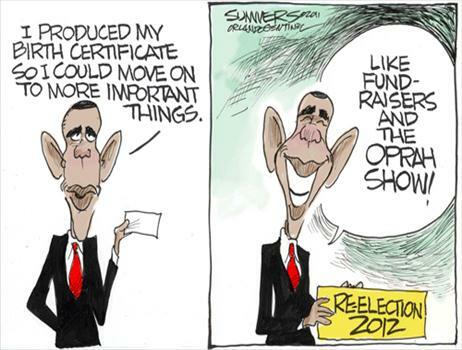 Birth certificates? We don’t need no stinkin’ birth certificates. We’ve got the Chronicles of Barack. And though I’ve had to read them to you in the past, it appears I’ll have to do it again. So gather round my friends — you, too, Donald Trump — and let’s fill our Hopium pipes and talk of how Obama truly came to be. 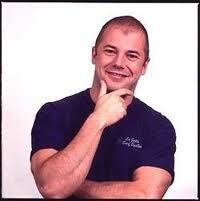 Some chroniclers say that as a child, he had to be tricky and devious, so that his enemies couldn’t catch him. And others tell of the magical weapons he was given by the South Side gods, including the magic dust to sprinkle on the foreheads of journalists, so as to cure them of skepticism. But in the beginning, he was alone. As an infant, the tiny Obama was placed in a reed basket, which floated gently down the Chicago River. The current carried him to the South Branch of the river, to the Kingdom of Bridgeport, where the women of the Daley clan found him bobbing against the far bank. They took the babe and nurtured him. And Obama was made a royal prince. He grew tall and strong, confident that he would perform many miracles, such as providing health care at no additional cost. Others say that he was not found in a reed basket, but that instead, Obama sprang fully formed from the forehead of convicted influence peddler Tony Rezko (right between those bushy, bushy eyebrows). Either way, the Daleys so loved Obama that they dipped the child in the Kelly green waters of the Chicago River on St. Patrick’s Day, hoping to make him immortal The Chicago Way. The dipping was done by Cook County Commissioner Johnny Daley, the least formidable of the Daley brothers. Johnny lowered the babe into the water, holding the kicking child by the ears. Those ears, never submerged, would forever be known as Obama’s spots of weakness. Once Obama had been dipped into Chicago’s mystical river, he continued his journey. And that’s when he met another young hero by the name of Rahmulus. Amazing hieroglyphs found hidden in a crawl space at the University of Chicago suggest that Obama and Rahmulus became as close as brothers. In one panel, Rahmulus and his adopted sibling Barack are depicted suckling the milk of a she-wolf to gain strength and cunning. Eventually, they built empires together. Obama became president. Rahmulus became mayor of a great Midwestern city. Yet before Obama could earn his seat in the Pantheon of Chicago Politics, the young prince was given a list of great labors to accomplish. First he had to stomach the crazed sermons of the Rev. Jeremiah Wright and smile, and then pretend not to have listened to Wright for years. Later, he was compelled to seek the political blessing of terrorist William Ayers. And then he challenged hundreds of signatures on the nominating petitions of state Sen. Alice Palmer, brutally knocking Palmer and others off the ballot in 1996 so he could run unopposed in the Democratic primary. [Don’t forget that both his primary and general election opponents’ divorce records were mysteriously leaked. My addition] And all this he did in the name of democracy and fairness and liberal idealism. After he completed these tasks and many others, Obama was rewarded when Rezko became his personal real-estate fairy, and helped Obama get that dream house in Kenwood. And then another wonder happened just the other day involving Trump and the birth certificate. 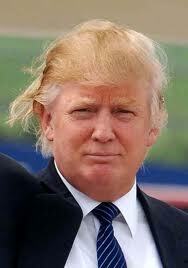 Mr. Celebrity Apprentice became so popular with the Obamanots that they stopped paying attention to other potential Republican candidates. Those other candidates may have ideas, but they certainly don’t have cool helicopters and their own reality TV show and hot girlfriends with accents. After being conditioned with Pavlovian certainty to react to any mention of birth certificates, the Obamanots held Trump close. They praised him. And as they applauded Trump, and as he held news conferences talking of how proud he was of himself, an amazing thing happened. The other Republican candidates — the ones with actual ideas — suffocated for lack of oxygen. Is it possible that this is what Obama wanted all along? I mean, the guy isn’t really from Hawaii. He’s from Chicago, where politics isn’t some fairy tale. I have great respect for those who make their living by performing in public. It requires a great deal of courage to risk making a fool of yourself in front of others, particularly when those others may number in the millions. It particularly takes a lot of courage, I would think, to be a talk show performer. Obviously, you are almost certain to say a number of spectacularly stupid things if you must talk extemporaneously 5 days a week on TV or the radio. 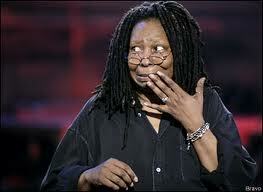 Which brings me to The View and its “host” Whoopi Goldberg. Whoopi’s predecessor, Rosie O’Donnell had to leave The View after making so many embarrassing statements that even the often embarrassing boss of the show, Barbara Walters, was embarrassed. Of course, he could’ve ended the silliness years ago when it was initially raised by Hillary supporters, as reported by Politico a few days ago. My take is that he didn’t end the silliness because he thought it was helping him politically by making his critics look kooky. He ended the silliness now because polls showed a large number of people thought he may have been “foreign born.” In other words, he calculated that the issue may have been hurting him more than his opponents. This shows a disturbing aspect of Obama’s character. Like when he denounced Jeremiah Wright only after his “mentor” attacked him personally, Obama decided to end the birtherism “silliness” only when it appeared that it may have been hurting him, not the country. But then, even if the Libyan mission were crowned in success, it wouldn’t make the moral pretentions of the US adventure there any less disingenuous. And this is not simply because the administration-backed rebels include al-Qaida fighters. The fact is that the moral arguments used for intervening militarily on behalf of Gaddafi’s opposition pale in comparison to the moral arguments for intervening in multiple conflicts where the Obama administration refuses to lift a finger. At a minimum, this moral inconsistency renders it impossible for the Obama administration to credibly embrace the mantel of moral actor on the world stage. Consider the administration’s Afghanistan policy. Over the past week, the White House and the State Department have both acknowledged that administration officials are conducting negotiations with the Taliban. Of course, the Taliban are not simply not America’s friends. They are the enemy of every good and decent human impulse. The US went to war against the Taliban in 2001 because the Bush administration rightly held them accountable for Osama bin Laden and his terror army which the Taliban sponsored, hosted and sheltered on its territory. But the Taliban are America’s enemy not just because they bear responsibility for the September 11 attacks on the US. They are the enemy of the US because they are evil monsters. Under the Taliban, the women and girls of Afghanistan were the most oppressed, most terrorized, most endangered group of people in the world. Women and girls were denied every single human right. They were effectively prisoners in their homes, allowed on the streets only when fully covered and escorted by a male relative. They were denied the right to education, work and medical care. Women who failed to abide in full by these merciless rules were beaten, imprisoned, tortured, and stoned to death. The Taliban’s barbaric treatment of women and girls probably couldn’t have justified their overthrow at the hands of the US military. But it certainly justified the US’s refusal to even consider treating them like legitimate political actors in the 10 years since NATO forces first arrived in Afghanistan. And yet, the self-proclaimed champions of the downtrodden in the administration are doing the morally unjustifiable. They are negotiating, and so legitimizing the most diabolical sexual tyranny known to man. Obama, Clinton, Power and their colleagues are now shamelessly advancing a policy that increases the likelihood that the Taliban will again rise to power and enslave Afghanistan’s women and girls once more. As Heibrunn notes in his profile of Power, she and her colleagues find concerns about US national interests parochial at best and immoral at worst. Her clear aim – and that of her boss – has been to separate US foreign policy from US interests by tethering it to transnational organizations like the UN. Who’s Loonier: Barry Birthers or Trig Truthers? Trig Trutherism, the surprisingly resilient conspiracy theory that Sarah Palin is not actually the mother of 3-year-old Trig Palin, is experiencing a boomlet thanks to a new academic paper that endorses the concept. 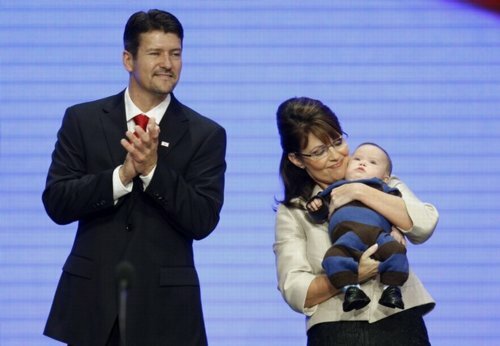 Long pursued by the blogger Andrew Sullivan and a significant segment of the Palin-hating left, Trig Trutherism holds that Trig’s real mother is either Bristol Palin or some third party, and that Sarah Palin herself faked the pregnancy to avoid embarrassment for her daughter or for political gain or some combination of reasons. The “Palin faked her fifth pregnancy” rumor is back, prompting Andrew Sullivan to tip us off to the title of his autobiography with a post titled “Wimpy and Gullible”. By Hawaiian law, birth records can be released only to people with “a direct and tangible” interest in them — a person born in the state, say, or certain relatives or their estates. 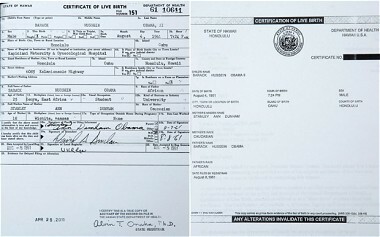 So when questions about Mr. Obama’s birth first surfaced during the 2008 presidential election, his campaign posted a copy of his “certification of live birth” on a Web site; it states that Barack Hussein Obama II was born in Honolulu on Aug. 4, 1961, at 7:24 p.m. So there is a more complete file of “original records” which could be released to Obama, but he has not requested it. Why not? Who knows? And Sully can’t even grasp that basic issue. 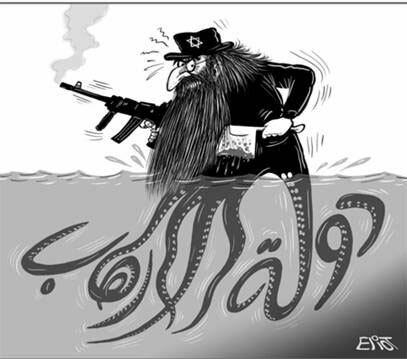 For the Israelis, anti-Semitism is merely a nightmare. For the Palestinians, it’s a catastrophe. If you believe, as I do, that the Palestinians’ cause is just, nothing could be more depressing than to hear them spout the very stuff that guarantees they will never get an even break. The mad idea that the Jews have no right to exist is a potent intensifier of the almost equally mad idea that the State of Israel can somehow be eliminated. I say “almost” because a friend of mine in Australia recently presented me with a plausible case that the Middle East would probably be a more peaceful area if the State of Israel had never been founded. Like her argument that the Aborigines would have been a lot happier if the Europeans had never shown up, this contention was hard to rebut, except by rudely pointing out that we were both sitting in an Italian restaurant in Melbourne, history having happened. If Israel, between 1967 and 1973, was fatally slow to realise that the Palestinians had fair nationalist aspirations, one of the reasons was that they seemed to be doing fairly well. Arabs in the Occupied Territories, as Arabs have always done within Israel itself, prospered economically to an extent that might have made the leaders of the Arab nations wonder why their own poor were quite so destitute. Luckily the anomaly could be put down to the continuing efficacy of the infinitely subtle international Zionist plot. Israel came so near to losing the 1973 war that Golda Meir and Moshe Dayan both had to resign in apology. It was the end of the old Labour Alignment’s preponderance in government. Begin was at last allowed into the Knesset from which he had previously been excluded as if infected — which indeed he was — and the inexorable rise of the hardliners began. But even then, the settlement movement might have been slower to start if a bunch of PLO “moderates” had not attacked a defenceless school containing nobody except 22 Jewish religious students and murdered them all. In his famous 1968 interview (the very year of protest) conducted for Sing Out! by his friends John Cohen and Happy Traum, Dylan was asked by Traum: “Do you foresee a time when you’re going to have to take some kind of a position?” Dylan answered in one word: “No.” Traum, obviously upset, argued that “every day we get closer to having to make a choice,” because, he explained, “events of the world are getting closer to us … as close as the nearest ghetto.” Dylan’s answer: “Where’s the nearest ghetto? Yet the anonymous AP reporter still refers to Dylan as an American “folk singer,” a label he strenuously rejects, and the author of “classic anti-war tunes.” That the president of the Vietnam Composers’ Association thinks that Dylan used music “as a weapon to oppose the war in Vietnam” only reveals his ignorance as well, and speaks to an image of Dylan that never in reality was warranted. Nor is it accurate to say that Dylan’s music “during the tumultuous 1960s touched thousands of young people…angry that a draft was being used to send young men off to die in Southeast Asia — to take to the streets and demand that Washington stop the war in Vietnam.” One might say that about the openly anti-war John Lennon, who even led a march in New York City, but definitely NOT about Bob Dylan. Yes, Communist China — capitalist in economics and totalitarian in politics — is continuing political repression, something which defines the very essence of Communism. To many young Chinese, Dylan himself stands in his very identity for freedom, the freedom of the artist to define his own path, and to reject government control as a necessity for the creation of art. When Dylan at age 22 walked off the Ed Sullivan Show because Sullivan refused to let him sing “Talking’ John Birch Paranoid Blues,” he was protesting a censor in his own country, demanding the right to sing what he wanted and to not let commercial TV people tell him what to do. 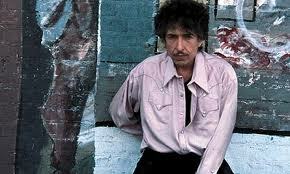 By going to China and singing songs obviously the censors could not make head or tails of, Dylan was making a major breakthrough, and allowing Chinese youth who do not know about him to listen to all of his songs, including the ones Dowd thinks are essential. In the rest of her article, Dowd contradicts her main argument by quoting from music critic David Hajdu and from Dylan’s own Chronicles to show that Dylan never considered himself to be any kind of voice of a generation or a protester, and consciously rebelled against the label put on him — one, obviously, that still sticks, despite the fact that many of those writing about him by now should know better. What Ron Radosh is describing is another example of the post-60’s left’s campaign to rewrite and “update” history in support of their current politically correct agenda. Message: It’s your fault…Buy a hybrid. Wait till the high-speed rail-link is built between Dead Skunk Junction and Hickburg Falls. Climb into the fishnets and the come-hither smile and hitch.